Considered one of the most popular dishes in Indian restaurants, Chana Masala is a wonderful spice blend that can be used in almost any recipe that calls for curry. This tasty masala originates from the Punjab region of India, and is also referred to as Chole Masala. Its unique regional blend is ideal for garbanzo beans and in bean stews. Highly recommended for vegetarian curries and stews. Delicious when rubbed on meats before stewing or sprinkled over fish before broiling. Use this versatile seasoning in dips, soups, sauces and stir-fries to create a flavorful, healthy, and low-fat meal. 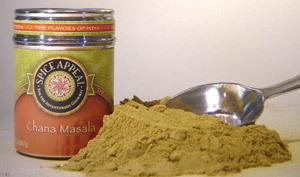 Contains coriander seeds, red chili, turmeric, cardamom, cloves, and other spices.